It is estimated that there is one woman diagnosed with breast cancer every eleven minutes in the UK. Yes thats right one person, their family, their friends, their colleagues knocked side ways by the diagnosis, every eleven minutes. And sometimes in my job it feels like I know them all. Of course I don't but it's a rare day when I don't connect with someone who has just been diagnosed, heard good or bad results, lost someone they love and all the shades in between. Breast cancer after all is called a common condition, it's impact felt by many and on every one of these occasions there is a tough road to travel. Our work in Breakthrough helps to make some of these roads a little easier I hope and also very importantly gets better outcomes for them. But we also want to prevent this happening to more people. And the other reason is I know even with my early diagnosis it has had an impact I cant just ignore. Prevention is better than cure, it's something that trips off the tongue, doesn't it? But I wrote some of this sitting on a train and fighting a headache that never feels far away just now,a daily reminder of my current struggle with my health. And when I read so often of how fellow travellers too are felled by the impact of diagnosis, treatment and the disease itself I know it is so , so true that even with a succesful outcome, breast cancer takes a huge toll, both physical and emotional. So yes prevention deserves our focus and resources. I have made the decision to delay the top up surgery I was recommended to have next month. Its not the right time for me, I know in myself. I need to feel stronger and also I need to get on with my life. I am not saying never but thats what I am thinking.Its good to have made the decision finally. Another step forward of sorts! Reasons to be cheerful. My holiday is here, not only offering precious time with those I love but also in a beautiful, restful, healing place. 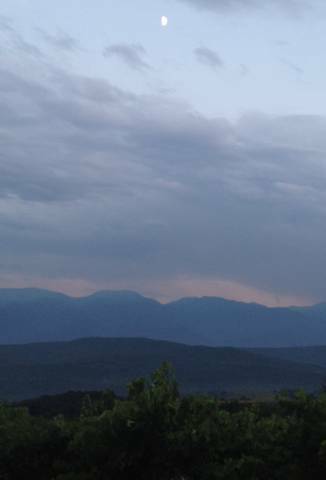 I have shared an image of the mountains nearby, after a storm. Seems appropriate somehow. Also the opening ceremony of the olympics was full of surreal images and heart tugging links to what it means to be from the UK. Not least the hommage to the NHS, what puts the Great in modern day Britain indeed, the symbol of compassion for all.I get a tingle as I write it, its a proud one! One worth celebrating for sure. It's how the light gets in. What do you do when you are stuck on a train? If you are me you read, tweet, email, text, listen to music and that's just the first hour! After six and a half hours and approaching home I was falling asleep and I asked twitter for help,the train was going on to Aberdeen but I wasn't....I hoped. Sing and set your alarm both useful suggestions. I'd just been listening to Leonard Cohen and a singalongaleonard would be an unwise move, not least for my fellow passengers. But I arrived eventually exhausted and reflecting again on the balance of my life; that would be lack of it really. But i was up the next day for a breakfast meeting where I enjoyed a wide ranging discussion on health and social care integration. Yes really! We discussed that loneliness was the fastest growing long term condition, living longer in single households an important factor but also how our communities function. Our lives so busy, so insular, so unconnected. It has stayed with me as has the need to prioritise solutions to this. And this discussion happened in the context of me knowing that through social media, but twitter especially , I connect to a breast cancer community. A community often who too are ill and isolated through their illness and fear. And their stories, though blogs and twitter often strike a cord, a connection but sometimes too hold my own fear to the mirror. Inspiring and reassuring often; frightening, on occasion. But that is this world, it's honest and it's real. And my guess is it helps many.So maybe some of us don't see our neighbours but we connect across the world to fellow travellers in such a wonderful way. And you can choose to engage or not. No requirement to have the make up on, put on a face, when you just can't. But equally if you want to bury the whole thing in a cave and leave it behind ,you can do that too. Just this week I saw the power of twitter to offer support to someone newly diagnosed in such an immediate way. I am moved by the kindness and compassion I witness. Go twitter....! Yes social media can connect the wounded healers and the wounded in so many ways. Ways in previous life times would be unimaginable. We can't go back but maybe we can look forward to connect through digital means which help a little. Although a life without a hug would be a sad one indeed. Let's not forget that. Reasons to be cheerful. I was introduced to the TV comedy Twenty Twelve this week and really enjoyed its wry take on the run up to the London Olympics. Way to go! Also in order to attempt to address work life balance (ha) I went to great concert in the Jazz and Blues festival here. The last song was about the Mojo....oh yes I remember that. Wonder where I left it? And I have been listening more to music, mindfully. It's been really helpful . 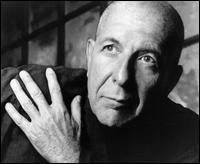 The Anthem by Leonard Cohen is with me as I write this blog, hence the quote i began with. You know in that moment when you notice your mobile phone has three missed calls in a short space of time, that there is something wrong. And there was. Someone very dear to us had had a heart attack. Your own heart stops too for a moment until more details emerge. Then as the details emerged we were reassured that it was a mild one and with the right care and rehabilitation all will be well. Thank goodness. And as I write she is home and doing well. Yes that's right, she. Did you assume perhaps that it was a he, as I said a heart attack? Because women do have heart attacks and often underestimate their risk. What is important is that all women are knowledgeable about potential risks to them and the impacts on their health and know how to modify their risk where possible, whether that's breast cancer, heart disease or conditions like diabetes. And the good news, in a way, is that keeping active, keeping your weight down, not smoking and watching your alcohol intake will help reduce risk of all those conditions. We also need to know the signs and symptoms in order to be diagnosed early. As in breast cancer, so it is with heart disease, an early diagnosis is important for good outcomes. Here are the factors to look out for at BHF Heart Attack Symptoms.And here too is our TLC campaign. Knowledge is power remember. Comparing heart disease with cancer also raises the issue of cardiac rehabilitation. It is now built into care, every person following an event like a heart attack, is encouraged to take part in cardiac rehabilitation. This is aimed at re-establishing emotional and physical well-being, understanding the need for both. How much of a reality is this for people recovering from cancer? I suspect it's the lucky few who get a programme of care at the end of active treatment. The evidence base is certainly building for women with breast cancer of the benefits of physical activity. Without this so many of us will not return to full health with all the related impacts.We need more evidence to understand fully what people need to do post a diagnosis of, and treatment for, breast cancer and then ensure they all have the opportunity to take part in it. As in any illness of course some of it has to be down to ourselves to do those things to manage our way forward and to care for ourselves. And I do write that with not a little sense of irony. Recognising that since I have gone back to work I have been less able to care for myself; to walk, to relax, to have time to smell the flowers. And I confess yesterday I set off to work without any make up on........yes that's right, no make up!!! I nearly checked myself straight in to see the doctor. That is a very serious sign in my world. My family are highly entertained and alarmed in equal measure. And the conversation in the office was, if your partner noticed would they dare say anything ( mine was out at the time). The consensus was ...damned either way. Sorry guys! Reasons to be cheerful: So glad to have a happier ending to this week. Long may that continue. I am off soon to a lovely part of the Lake District. I hope it ,at least, doesn't rain . It will be great to see family and have a bit of time to not only smell the flowers but also look at the hills too. ( not planning to climb any!). 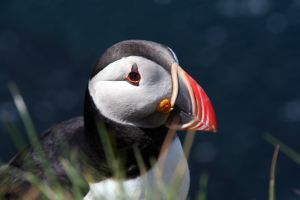 Close to home the local sea bird centre has asked people to look out for pufflings that may have been washed out of their burrows by the floods.So I am on puffling alert too! To see oursels as others see us? I have had some really uplifting feedback this week . In particular the blog from Jayne Cox who is woman I have met on twitter on jaynemcox, a coach for women especially those with confidence issues and she asked me to be this months WOW woman. It stands for woman of worth and I guess any other complement is in shadow of that. She asked powerful questions and my answers to those make, I think, a moving blog. A local journalist too did a very perceptive piece about my story and our important work. She entitled it "when the helper needs help". These experiences and others have made me ponder on self perceptions. Because my reaction is the most telling thing of all. When my doctor was recently summarising my medical history she said "so you have recurrent breast cancer and severe asthma". I was shocked, really shocked. No I wanted to say that's not me, I've just had a bad spell, the cancer was very early, I will be fine soon. And then I reflected on her words and thought, well I guess that's why I am feeling as I am. Duh! I hear you cry but it's just that I don't see myself as a sick person and don't want to either. Tempting though it is to find an appropriate chaise lounge and demand peeled grapes ( or Percy pigs or mini poppadums even!) I much prefer to get on with life. But when the story in the Evening news came out entitled "When the helper needs help" I could see my colleagues wondering how I would react. She won't like that title ..writ large on their faces. But hey I took it on the chin.....the article is lovely and covers our One Day campaign. Happily the on line version has no photograph , a bit too much of a close up for comfort. And there are other perceptions that need challenged. Legionnaires disease has claimed three lives in Edinburgh this summer ( what summer ?) and many more have been unwell as a result. Others of course have been very anxious and the authorities deliver advice and reassurances. The one that always gets me is the one that seeks to reassure by stating those most at risk are those with underlying health conditions. And I have to catch myself feeling a little reassured for a moment until I accept my and many others reality. Hang on a minute there, over 2 million people live with long term conditions in Scotland. And almost 4,500 women are diagnosed every year with breast cancer alone . And their treatment even will meet with definition of a long term condition, not to mention the ongoing impact of living with a cancer. The imminent risk from legionnaires disease is passing thankfully but take a thought next time there is a public health risk before those with underlying health problems are casually written off please. Their need and risk is greater and the appropriate advice needs to be tailored to them too, let's remember. OK I feel better having got that one off my chest! So I am glad I got through this week and it's had some great highs but lows too. Not least the thundering headache I fought for a couple of days. As I traveled back home from work I found myself fretting about how I was managing my well-being on my return to work. As I walked through the door I saw a bunch of flowers from a friend with an eerily timed message to take time to smell the flowers. An important reminder to do that and I know if I'm honest I'm not doing enough. Important note to self. Reasons to be cheerful. It's simple I have such good people ; family, friends and colleagues in my life and I value them every day. 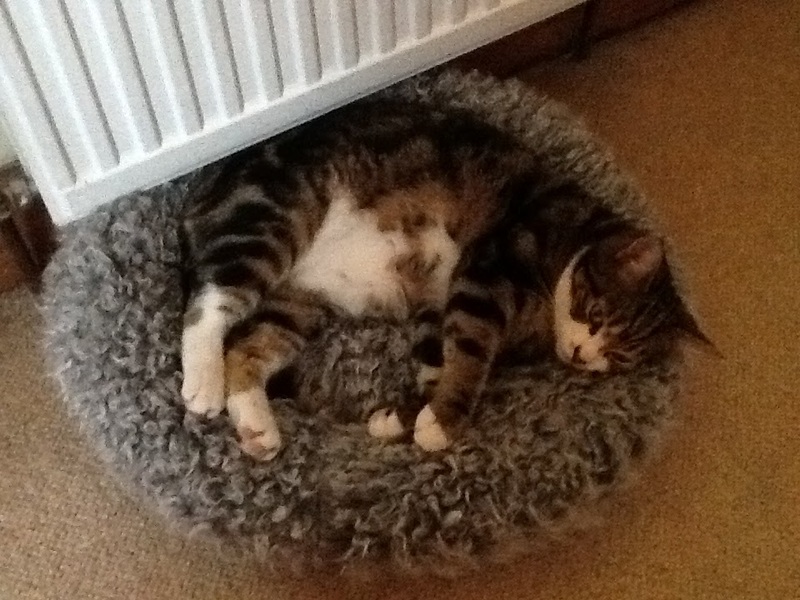 The weather here has been so bad its having a serious effect on the cat. He is "getting " fat. The daily trying every door in case its not raining outside each one is his only exercise just now. Its the only thing that makes me laugh with regard to the weather.........Oh and Andy Murray is in the final of the tennis.....fantastic. We are meeting friends but aim to tape it and watch later. So no spoilers please!! !